Pain, fatigue, brain fog…these are just a few of the symptoms you experience with Fibromyalgia. And, for those who still say it’s all in your head, I can only hope they are never afflicted with the condition. I’ve been experiencing a flare up for the past two weeks. I just want to pull the covers up over my head and fade into my mattress. I want the pain from my neck to my knees to stop. I slowly sit up and quickly lay back down. I do this repeatedly for at least a half hour; making me late for work by a few minutes every day. Once I finally put my feet on the floor and attempt to stand up, I feel like I am twice my age. I gingerly put one foot in front of the other, try to keep my balance and walk. Bending over is almost unbearable at first. It is hard to explain the pain you feel all over your body; especially to someone who has a very high tolerance. 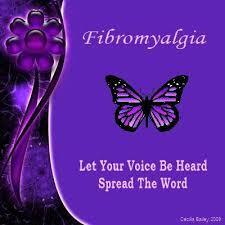 The pain that would seem “normal” to most is excruciating to those of us with Fibromyalgia. The slightest touch can cause us to retreat in the other direction. There is medication available, but some must fight with the insurance companies for approval, even for the generic. I feel for those who cannot afford the medicine, because at least in my case, it has given me some relief. I know for me, stress is a huge factor in my flare ups; and, unfortunately no matter how much we try to manage stress, it is part of life; just as is Fibromyalgia. So, the next time someone says they are living with Fibromyalgia, please do not discount the credibility and existence of this medical condition, because unfortunately, I can attest first hand it is real and NOT in my imagination.